The Macau boundary crossing point on the Hong Kong-Zhuhai-Macau (HKZM) Bridge handled a total of 407,241 inbound travellers during the period from October 24 – when the bridge opened to commercial traffic – to November 20, according to statistics provided to GGRAsia by Macau’s Public Security Police. The majority of travel movements were via Hong Kong, according to the figures. The official data did not contain a breakdown of travellers by nationality. A total of 354,441 of the recorded travellers entered Macau from Hong Kong via the HKZM Bridge during the reported period. The balance – amounting to 52,800 visitors – arrived via Zhuhai. The sea-crossing HKZM Bridge spans 55 kilometres (34 miles). The Macau boundary facility for passengers and vehicles arriving via Hong Kong is open 24 hours a day; that between Macau and Zhuhai is only open between 8am and 10pm each day. China’s Ministry of Transport reported last week that there had been in aggregate 1.79 million traveller movements – or on average, a total of 64,000 per day – from the structure’s launch to November 20. Traveller movements in and out of Macau via the bridge during that period amounted to 708,154, representing nearly 40 percent of the traveller movements via the bridge, according to the figures of the ministry and local police. From October 24 to November 20, there was a daily average of nearly 22,189 traveller movements between Hong Kong and Macau via the HKZM Bridge. The daily average of traveller movements between Zhuhai and Macau via the bridge, totalled 3,103 people, according to Macau police data. The Macau authorities had estimated - in commentary released in early October – that the Macau boundary crossing could handle a maximum of 10,000 traveller movements per hour between Zhuhai and Macau via the bridge; and about 15,000 traveller movements per hour between Hong Kong and Macau. On November 13, Yu Lie, deputy director of Hong Kong-Zhuhai-Macau Bridge Authority, told local media he believed the governments of Guangdong, Hong Kong and Macau would work to optimise traffic flows on the bridge, namely by increasing the number of people and vehicles allowed to use it. The current special quota system defining what vehicles from mainland China can travel to Hong Kong or Macau via the bridge, would likely stay, but be widened, said Mr Yu at the time. But the South China Morning Post newspaper reported on Saturday there had been complaints by locals of overcrowding at Tung Chung, a town near to a Hong Kong entry and exit point for the bridge. The media outlet added that tourism authorities in Guangzhou had sent out what what was termed an “urgent notice” to mainland Chinese travel agencies to avoid sending tour groups to Hong Kong via the bridge on weekends. The newspaper also separately reported – citing figures from a source it did not identify – that by 8pm on Saturday there had been a 33 percent drop in the number of traveller movements inbound to Hong Kong via the bridge – to 30,096 – from 45,034 on the same day a week earlier. The newspaper also reported that day that the Hong Kong authorities had been monitoring that side of the bridge for unlicensed tour groups from Guangdong. 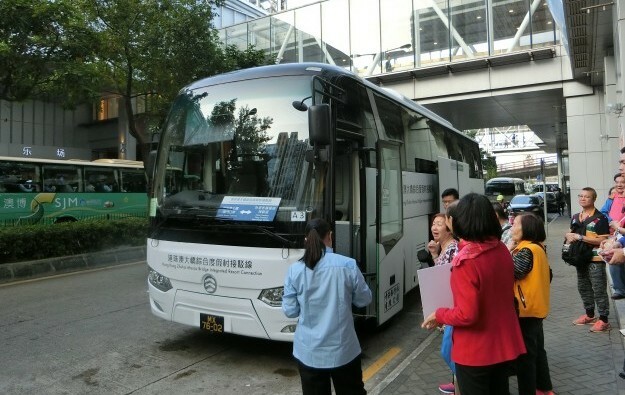 A Macau travel guide association last week complained unlicensed tour guides had been using the bridge to ferry into Macau mainland tour groups, later putting them aboard free casino shuttle buses rather than hiring local coach companies for the work.